Fitness and nutrition for a creative life. A few years ago, my son asked me what job I would want if I could do anything in the world. He said that I had to be absolutely honest. I had to dream without judgement. If I could do anything, I would sing, and dance, and wear beautiful clothes, professionally. After the interview, Colin told me that he thought I really wanted to be a fashion model. "Right," I thought. I'm over 40 and under 5'2," so that's ridiculous. You see, what I taught myself over the years is that the key to happiness is to find a way to stop wanting what you can't have. In truth, that's just a way to stop getting hurt. Still, I have learned a few more helpful things over the past 54 years of seeking love, fulfillment, and happiness. Starting today, I am embarking on an experimental journey that requires me to create what I desire and do what I love in whatever way, and at whatever level I can. I resolve to be an amateur, as the word amateur comes from the Latin: amare. To love. So I will sing, dance, act, and model as an amateur: for love. I will see how living in love will affect my actual "Living." I work as a personal trainer, group exercise leader, and fitness author. This is how I earn the money that helps me afford to sing, dance, act, and dress. I see that my physical practice and my work combine to give me the freedom to do what I love. Sugar Freedom and Cardio Freedom, my nutrition and and fitness programs, combine to give me the material and physical ability to create what I love, and I love Truth, Beauty, and Goodness. So how is this a remedy for vanity? I have come to understand that vanity in my case is the longing to be beautiful and admired. The remedy is the determination to create what is beautiful, and do what is admirable for the sake of goodness. 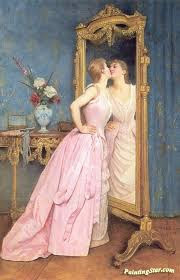 Now, I see that, The cure for vanity is the decision to create beauty instead of merely possessing it. Soon, we leave for New York where I get to sing with the alumni of my college women's choir. This weekend, I can participate in Sonora Sings Classical, which is a group that gets together for an impromptu practice of classical choral music. The opportunities to be an amateur and do what I love are just waiting for me to have the courage to step into them. So how about you? What do you love to create and do, and where can you find your chances to be an amateur for the sake of your own happiness and goodness? How to get off of sugar now. Quick Weight Loss Workout: Because Sometimes Shorter is Better! Back when I was struggling with obesity, I was suffering through as much as 12 hours of cardio a week without getting any lighter or leaner. I was combining swimming, spinning, aerobics, and trying to run on the treadmill. It was awful, as these are all activities that either I'm not very good at, or that I don't enjoy. They made me tired and sad, but I kept grinding away until I learned about the benefits of weight lifting, interval training, and yoga. It turns out that endurance exercises like running, aerobics, and swimming don't suit my muscle fiber type, or my attention span. The combination of physical discomfort and boredom lowered my enthusiasm and increased my appetite. My program was a lose/lose to say the least. When I finally got fed up enough to take a chance on exercising less with more intensity and better form, everything changed, including my appetite. Now I specialize in working with people like me who don't respond well to traditional calories in/ calories out weight loss programs. This particular Kettle Bell Tabata session is easy on the knees too. Years of doing endurance cardio while I was overweight did a number on my knees, so now with osteoarthritis in my left knee I have the challenge of keeping it functional while not increasing the damage. The combination of an anti-inflammatory diet that eliminates, sugar, grains, and vegetable oils with interval training has truly turned back the clock. Here are the exercises if you'd like to give it a try. Kettle Bell Swings, Diagonal Press, and KB Rows. Do circuits of the 3 exercises: 20 seconds of work with 10 seconds of rest in between. For the rows, do 8 on each side. Complete 8 rounds, and you're done! This session is short enough that you can do it anytime. I like to do this if I get sluggish in the afternoon, or as a morning wake up call on days when I'm not doing a traditional weight lifting workout. No matter what kind of training you choose, remember that you can enjoy fitness and get wonderful results. The two things I did to permanently heal my obesity. Today, I'm going to share the two things I did to permanently heal my obesity. 1. I eliminated the foods that caused hunger from my eating plan. 2. I eliminated the exercises that caused pain from my training plan. When I was eight years old, my pediatrician recommended weight loss. He told me to count calories, and he told my mother to put me on the swim team. After that he food I was offered, was low fat, high carb, calorie controlled, and full of sugar. As a result, I felt hungry all the time. I was a poor swimmer with very little tolerance for endurance exercise, so the swim coach ignored me. I didn't receive any instruction on how to improve. I was just put in the slow lane and left to keep up if I could. This toxic combination of hunger and pain caused me to gain fat every year, until I finally turned to cigarettes and diet pills. They did help me to stay fairly slim as a young woman, but when I gave them up in order to get pregnant, I became obese and I stayed that way for years after I had my son. Finally in 2008, I cut out sugar and lowered my carbs until my appetite was finally manageable. I replaced traditional cardio with resistance training, interval training, and Yoga. I was healed and I stayed healed. I want the same for you and for anyone who reads sugar freedom. I want you to discover the foods that don't make you hungry and I want you to discover the kinds of movements that don't cause you pain. I don't think there is any reason that you should have to put up with the kind of literal torture I felt when I was on swim team when I was embarrassed, humiliated, by my inability to keep up. What I have learned from my personal training clients is that they have a lot of grit, drive, and determination. What they lack is a program of exercises and training that will do more than make them tired, sore, and hungry. When they learn how to safely lift weight, do intervals, and practice flexiblity and balance they get leaner, stronger, and more fit. To put it another way, the right training for you will not cause, "compensation," which is the term we use for the increase in appetite and reduction in the motivation to move that can result from excessive endurance exercise. I am aware that people who want to lose a significant amount of weight are getting a lot of mixed messages these days. We are still being told to eat less and move more, but I believe we need to hear more from individuals who have learned how to do that. Like me, many of my readers and students have overcome obesity by eliminating the foods that raise insulin in the blood stream. The science that I've seen shows that chronically elevated insulin was driving my hunger and fatigue. I believe that foods that elevate insulin are pro hunger, pro-inflammatory, and pro fatigue. The foods that don't raise my insulin: animal proteins and fats, eggs, and vegetables that grow above the ground are the ones that make up my daily menus. These foods don't cause me hunger and fatigue, they give me energy. It's a wonderful feeling of peace and satisfaction that allows me to get on with my life. I'm always cautious also about the advice of individuals who have never personally overcome obesity. They rarely understand the horrifying compulsion to overeat even in the face of the fact that overeating will wreck your health and your dreams. What I urge you to do is figure out a way to eat that doesn't cause hunger and a way to exercise that doesn't cause pain and fatigue. Your experience matters, and the willingness to eat for satisfaction and move for fun can make for a surprising level of improvement in your health and happiness. 1. What are the foods that energize and satisfy me without leaving me hungry? 2. What are the exercises and movements that help me enjoy life more without pain and fatigue? Please feel free to e-mail me with questions: catherine@cardiofreedom.com. I want to know about the specific struggles you are facing. if you have an exercise program that isn't working out for you, I am happy to consult with you, discuss what kind of training you're doing, and what you might replace it with that would be enjoyable, effective, and make you feel really, really good about yourself so that you can go out and enjoy your life. As we begin 2019, and I restart my fitness classes after the Christmas/New Year break, I find my self thinking about the growing number of people who are struggling with their weight. I ask myself these questions:Why do people choose to eat foods that don't make them feel well? Why do fashion and the media continue to require skinniness and glossy perfection from models, actors, and influencers? And personally: "Why do I consume media content and news reports that make me feel bad?" "If I had an hour to solve a problem and my life depended on the solution, I would spend the first 55 minutes determining the proper question to ask." It became clear to me that I hadn't found the proper question. How can I create the most joy, while causing the least harm? For example, dieting leads to hunger, which leads to overeating, which leads to the weight gain we were trying to overcome in the first place. Excessive exercise can lead to soreness and injuries which force us to stop exercising, leaving us weaker and less fit than we were in the first place. These paradoxes led me to ask what we should be doing instead, and I realized that we need a two part solution to the problem of fitness. We must insure that our positive actions:eating and moving better, don't end up causing harm: hunger and injury. I invite you to apply the question of joy to your wellness practice. What kinds of food can you prepare that will bring you the most joy while causing the least harm? How can you train, move, or play in a way that will bring you the most joy while causing the least harm? Does it make sense to apply joy to eating and exercising? I think it does. I know that I need something beyond thinness and appearance to inspire my choices when I eat and train, and joy certainly fills the bill! I invite you to write down three or four things that you enjoy more than snacking. Then I want to challenge you to eat the foods, and choose the moves that would be most likely to enhance those activities. In this way, you can go from a good question, to a better answer, and a happy outcome. How Do I Break Through a Weight Plateau? Please Don't Try To Transform Your Body Without This. How Do I Stop Bingeing? Two Days to the Transformation Talk!